Epson EB-1460UI with the brightness of 4400 lumens & having the resolution of 1920 x 1200 WUXGA 3LCD ultra short throw interactive projector is well capable of creating an impact on entertainment & business presentation. The contrast ratio of 16,000: 1 for 70-100 inches image on the screen can provide enough clarity & visibility from wide 0.4 m - tele 0.6 m distance. The lamp with 5,000-10,000 hours of durability requires only 300W power. This well reputed brand ensures greater connectivity with Stereo mini jack, MHL, S-Video in, HDMI, VGA in/out, Wireless LAN IEEE 802.11b/g/n, Wired Network, RS-232C, USB 2.0 Type B, USB 2.0 Type A, Miracast, Remote Desktop Connection, DVI out (whiteboard), Wireless LAN b/g/n (2.4GHz) for compatibility. This white colored affordable device has a great flexibility with the weight of 8.5 kg. 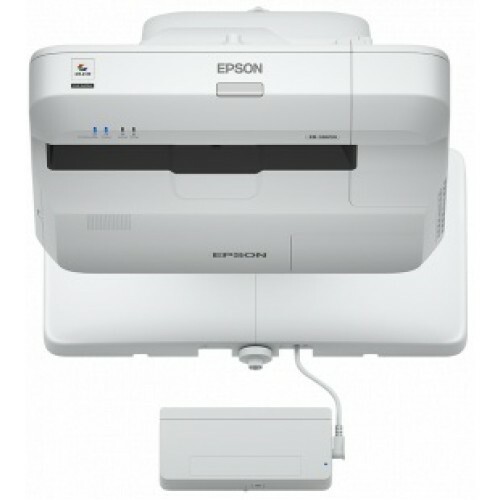 Star Tech offers best price with quality service in Chattagram, Rangpur, Dhaka, Sylhet & Khulna for Epson projectors. Enjoy bright, high-quality images in home or office with 01 year of warranty facility. Order online and have the delivery anywhere you want in Bangladesh.